Our son Ian was up in Scotland over the weekend. He was there to attend a wedding that had already cost him several hundred pounds. Most of that was spent on a four day stag weekend on the Spanish island of Ibiza. That's how it goes these days - stag and hen dos in faraway places - drinking excessively and spending lots of dosh on airfares, meals, accommodation etcetera. In contrast, my own "stag do" back in 1981 was a very quiet affair that involved walking down to our local pub - which was then "The Closed Shop" - to meet up with a small bunch of male friends for a few drinks. This is the first time I have ever seen any male member of my Yorkshire family in a kilt! The kilts we see today were largely a Victorian development - different from the rough lengths of cloth that highlanders once used to attire themselves. The thing you can see around Ian's waist is a sporran and you can easily guess what he has tucked in there. Under the kilt he was probably wearing what all Scotsmen prefer to wear - frilly women's bloomers from Marks and Spencers.! By the way - it's Ian's birthday today. He is thirty four years old. Happy Birthday Jock! I think that people have forgotten that it's the marriage, not the wedding that counts. How can it be good to have friends and family spend money they can ill-afford to spend on such celebrations? It's a trend over here, too. But I will say that your son looks fine in that kilt! Nice sporran! It is hard for friends to say "no" when invited on these pre-wedding junkets. Actually, I cannot easily guess what he has tucked in there. His elecric razor? His weed? His condoms? His 8x10 glossy photo (folded) of Prince Harry and Megan Markle? The possibilities are endless. As Yul Brynner once said, Is a puzzlement! His i-phone and his wallet. and a dirk in his sock! The Mr says a sporran is needed not only because you dont have pockets but also it keeps the kilt down when it is windy. Also there's a fly-hole behind it. And he is drinking wine!!!! Not a Single Malt in sight. Nope - that was indeed whisky in a wine goblet. He looks very handsome in his kilt. Do you like to see men in skirts Sue? Only if they have good legs. That's Paul's next birthday present sorted! My daughter has just come back from a friend's wedding in Dubrovnik. That wasn't too costly, but another friend has invited her to a wedding next year in Mauritius offering a group booking hotel reduction for a mere £4000 for a few nights. Needless to say she's declined that invitation! £4000 quid for a few nights? Crazy! Mauritius should be the honeymoon venue - not the wedding location. I don't know about where you are but the engagement and wedding business here has just taken off in the last few years.....and not in a good way! The poor parents and/or bride and groom having to pay (practically) a year's rent on a house just for all the goings-on before, during and after the wedding itself! Just a way for a lot of people to make a lot of money and the poor bride and groom not to have any left on which to live! Yuck! It is exactly the same here Sis. Profit hungry people approach weddings like flies around a honeypot. Everything has its price. It has become the thing to do - to spend the equivalent of a down payment on a house on a wedding. I hope it's a fad that will be short-lived. As for McPudding, I think a man in a kilt is a wonderful sight. We see quite a few in this part of the world in the summer because of the Scottish heritage here. I do notice there are none about in the winter. They could wear flesh-coloured woolly tights in wintertime. I shall float that suggestion at the first opportunity! That's twice now that I've forgotten to wish your son happy birthday - third time I'll get it right. All the best to him. He has had quite the year! Perhaps you should get a kilt yourself Mr C. It would go down a storm in Phoenix. Congratulations to Ian on his birthday! His birthday is just a few days after mine so he must be a proud Leo. 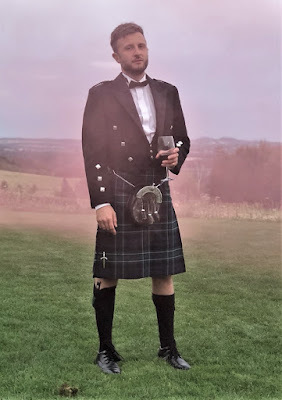 He is quite a handsome young man in his wedding kilt. A picture suitable for framing! Yes he is also a Leo! GRRRR! And late birthday greetings to you too Bonnie! Wow. Ian looks as good in a kilt as he does in his black BOSH! T-shirt. jenny-o said it: a man in a kilt is a wonderful sight. Happy Birthday to Ian: This is going to be an awesome year, the first of many many more. I more or less eloped both times I was married. All our money went for a month long foreign honeymoon...but maybe these days people don't choose between an extravagant honeymoon or a posh wedding. They do both. Many couples seem to spend far more than they can afford these days - as if seeking the magazine wedding. Well, Happy Birthday to Ian! I think he looks good in a kilt! As to the spending of all that money on weddings...I think it's silly, at best. And expecting friends and family to spend a lot of money (unless they have money to burn) is awfully selfish. Ian is not a wealthy man - in spite of the "Bosh!" success - there was pressure on him to go the whole hog with that wedding. I guess many others have felt the same pressure - often spending money they cannot afford. Ian is a handsome, fine-looking young man, and he looks very dashing in the kilt. I am feeling out of kilter tonight. :) I'm always out of kilter! I'm an old tart an there's no point denying it! Happy birthday to Ian. Yes some weddings and celebrations become irrational. Irrational! That's the word I was looking for Red! Happy birthday to Ian! He cuts a dashing figure in a kilt. By the way, I instantly guessed "iphone" when you asked about what we think was in his sporran. Expensive weddings and other celebrations are another expression of the self-indulgence which is not bad in itself, but is being taken a step too far by many these days. They see how "celebrities" have big dos for each and every occasion and want to live the same lifestyle, feel like a celebrity even if only for a few days. It's mostly way over the top, pompous and I can not even imagine it is much fun for the bride and groom - with so many guests around they can't possibly talk to everyone, and such high bills to pay. I have been married twice. We had no hen or stag parties and I dare say the lack of these (and the modest celebrations both times) were NOT responsible for my divorce from husband No. 1 or the untimely death of husband No. 2. So this silly trend is also apparent in Germany... I guess it is a fashion that has spread across the western world driven by TV and social media. Ohhhh! I love a man in a kilt ! How handsome Ian looks. He looks great, weddings can be so expensive, my father told my sister to stay on budget, and he'd buy her a car. She did, he did, worth every penny saved.